This tour will not only immerse you in outback Australia and its impressive landscape, Indigenous history and wildlife but, will also give you a once-in-a-lifetime pass to the Field of Light Uluru display. Engross yourself with guided hikes through the sandstone domes of The Lost City, the Garden of Eden at Kings Canyon and the Valley of the Winds with this tour. No visit to Uluru is complete without witnessing a spectacular sunset and this tour won’t disappoint. Not only will you enjoy dinner while witnessing the awesome sights of Uluru changing colours as the sun goes down but you’ll also wake up in the morning, witnessing Uluru’s breathtaking sunrise. 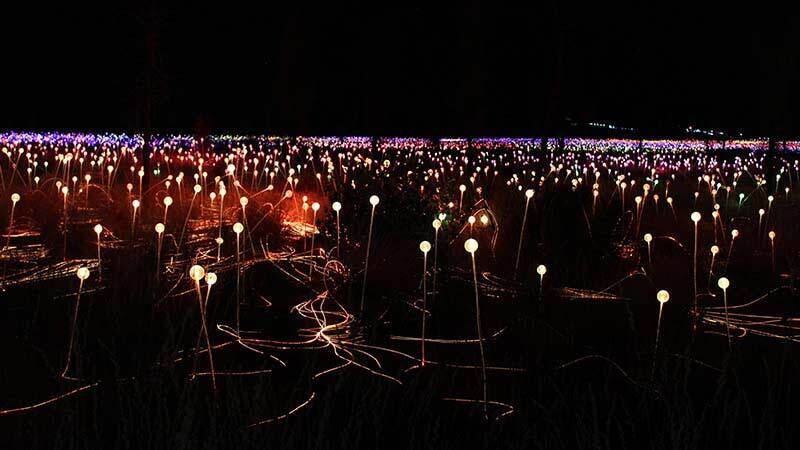 And, until December 2020, this tour includes an entry pass to the award winning Field of Light exhibition at Uluru. A global phenomenon, the field of light illuminates as far as the eye can see and lights up the desert. A camel ride is available at an additional cost on day three of the tour. The tour departs from Alice Springs daily at approx. 5.30am, arriving back at Alice Springs on the final day at approx. 5.30pm.